Our Redwood Pine Bullnose Architrave packs come with 5x2.25m lengths per pack. Free Delive..
Our Redwood Pine Chamfered Architrave packs come with 5x2.25m lengths per pack. 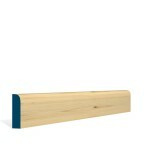 Free ..
Our Redwood Pine Ogee Architrave packs come with 5x2.25m lengths per pack. Free Delivery ..
Our Redwood Pine Torus Architrave packs come with 5x2.25m lengths per pack. Free Deli..